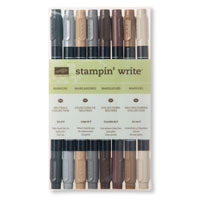 tags: Baby, Family, Online Shopping, Stampin' Up! My nephew and his wife recently celebrated the arrival of a new baby daughter, congratulations to the happy couple. This is the card I made for them. I used a card sketch I found on pinterest from the very talented Robin Messenheimer. Robin is so helpful she even provides dimensions and even though they are in inches not centimeters, I used her dimensions for the layers. I embossed Whisper White card using the Happy Hearts Embossing folder and attached it to scored and folded Chocolate Chip card. 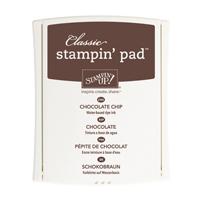 I stamped the greeting from the Perfect Pairs stamp set onto a small Whisper White square using Chocolate Chip ink. The other images are from the Something for Baby stamp set and were stamped onto Whisper White card using Pink Pirouette ink and cut out using the matching Baby’s First Framelits Dies. Each image is then attached to a square of Whisper White card and then Chocolate Chip card before attaching to another Whisper White/Chocolate Chip panel. This panel is attached to the card front using dimensionals. I added a small basic pearl to the duck image to represent it’s eye. Inside I inked up the pram from the Something For Baby stamp set using my Chocolate Chip and Pink Pirouette Stampin’ Write Markers. Something for Baby is such a versatile stamp set and I love that it has matching framelits. You will be happy to know that all of the products used in this card will be carrying over into the next catalogue, except the Perfect Pairs stamp set. However, in the new catalogue the Something For Baby and Baby’s First Framelits Dies will not be a bundle. 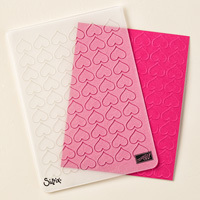 So if you want to save 15% on the purchase cost of buying the stamp set and the matching framelits, do not delay. The offer only lasts until the 31st May or until stocks run out. I’d love to know what you think, so leave me a comment. It makes my day when someone takes the time to tell me what they think. 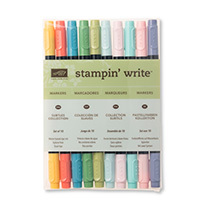 from → Baby, Family, Shop online, Stampin' Up!